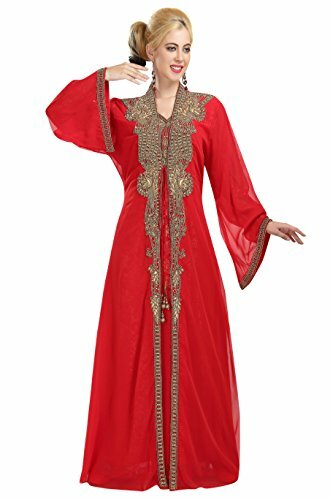 This Eye-Catching Elegant Is Perfect for Any Occasion, with the Golden color beads & sequins.This Hand Embroidery dress Keeps Ahead in the Fashionable Kaftan industry.This Red Color Georgette Kaftan is an Original Maxim Creation design and will be made to order. 2 Piece Set & Full Sleeve Kaftan Dress + 1 Free Head Scarf. From time to time beading may become displaced due to usage and this is not regarded as a fault but is due to the nature of the work. The dress is completely hand made. These garments should be worn with care. Heavily embroidered items can only be DRY-CLEANED. We cannot be liable for any damage to your garments due to non-compliance with these instructions. Comes with a matching inner.